I like the abrupt changes in the direction of the branches. It seems so random and gives it an exotic look to me. We live in Port Angeles and own a house with an upstairs. The deep reddish branches contrast with the bright green leaves and light up the rainy days. This tree is especially beautiful at sunrise or sunset. I've never really payed attention to a tree before I became attached to this particular tree and I don't know why, but I will miss this tree when we move to our house in the country. 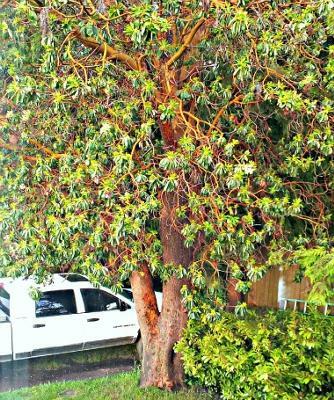 Sure like that Madrone tree... looks very happy and vital. Yes they sure do have a charm about them!